(Nanowerk Spotlight) In developing next generation data storage devices, researchers are employing a variety of nanotechnology fabrication and patterning techniques such as electron-beam lithography, photolithography, microcontact printing, nanoimprinting and scanning probe microscope-based lithography. A decade ago, IBM for instance introduced the Millipede Project, a thermomechanical AFM-based nanopatterning technique that was aimed at data storage systems. In atomic force microscope (AFM)-based lithography, nanopatterns are generated by the mechanical contact between a nanosized tip and a polymeric film surface such as PMMA. In IBM's Millipede system, the fabrication of the nanopatterns on PMMA is achieved using a heated AFM tip at about 350°C, although the exact temperature could vary with heating-pulse length and applied force. "In addition to the difficulties in the fabrication of heated AFM tips, a relatively large power is consumed because of the very small percentage (<1%) of heat transmitted from the heated AFM tips to the polymer film," Jin Kon Kim tells Nanowerk. "To address this issue, we have developed a novel concept for the fabrication of nanopatterns on a polymer film using AFM but without a heated tip." Kim, a professor in the Department of Chemical Engineering, and director of National Creativity Research Initiative Program for Block Copolymer Self Assembly at Pohang University of Science Technology (POSTECH) in South Korea, and his team have demonstrated that the writing, reading, and erasure of nanoscopic indentations on a polystyrene-block-poly(n-pentyl methacrylate) copolymer (PS-b-PnPMA) can be achieved by using an AFM tip at room temperature – no heating required. In the technique developed by the Korean team, the nanopatterns are generated on the film by the AFM tip at room temperature, and these nanopatterns retain their original shapes at room temperature. Kim explains that this process is only possible by using a specific block copolymer film exhibiting a baroplastic property that enables processing at a relatively lower pressure and temperature by microphase transition. The researchers have reported their findings in the September 13, 2009 online edition of Nature Nanotechnology ("Ultrahigh-density phase-change data storage without the use of heating"). "With our technique we were able to achieve an areal density of up to 1.03 terabytes per square inch, and we could have increased this value further if we had had a more sharpened AFM available," says Kim. 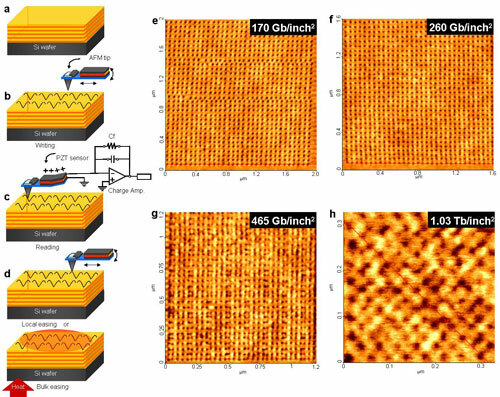 To demonstrate the practical applicability of their storage medium, the team transformed the generated nanopatterns into electric signals using a piezoelectric sensing method. They also showed that repeated erasing and rewriting processes – up to 10 cycles – were possible without any damage to the film. By placing the patterned film on a 120° warm heating plate they could bulk erase the entire film in two seconds. Local erasing of an individual bit (or line) was also done at room temperature by careful indentation near the pile-up region (or the rim of the nanopatterns). "We consider that this would be a milestone for development of next-generation high density data storage media" says Kim. "Furthermore, the ability of easy patterning could be used to fabricate nanostructures with very complex geometries."